Have you ever wanted something, or wished for something so hard that it not only fills your every waking moment, but your dreams too? Danny knows this feeling all too well, and in "Danny and the Dream Dog" by long-time blog and booky pal Fiona Barker with illustrations by Howard Gray, you'll meet the titular little lad who wants a pet dog more than anything in the world. The story opens as Danny's dreams are filled with dogs of all shapes and sizes. Small wire-haired yappy dogs. Sleek slim energetic dogs. Big lollopy cuddly dogs that trip through Danny's dreams on padded paws. The problem is Danny can't have a dog - and if you're a parent who has already had "The Pet Plea" from your kids (yes, we most certainly have with C, to the point where I think she'd settle for a pet Hissing Cockroach) you'll understand Mum's very sensible reasons for not wanting a pooch around the place. Danny is forlorn until a new neighbour moves in downstairs. A sweet little old lady, but more importantly a sweet little old lady with a bouncy and rather naughty pet dog called Maximus. The lovely old girl doesn't quite have the energy or strength to take Maximus out for his daily walk, and Mum comes up with a plan. Perhaps Danny can help out? It's been quite something to see the end-product of a LOT of hard work from Fiona. You can check out a guest post from her on this very blog later on this morning (at 11 AM prompt, so don't click the link until then!) to read an amusing play in three parts on her writing journey (including a little bit more about her foray into self-published picture books with the fantastic "Amelie and the Great Outdoors" which we reviewed yonks before we'd even met Fiona at one of her awesome Picture Book Club meetings). It's always satisfying to see someone we know finally getting a publishing deal. It's even more satisfying to be able to take a look at their finished product, see it polished and sparkling and ready to be placed in eager hands. Danny's tale is familiar, and it's going to appeal to a lot of kids who'll know and recognise its core message. It feels like a slice of 'real life' tucked between the pages of a picture book, no mean feat in a market dominated by children's books that feel like they have to preach as well as teach. Howard Gray's illustrations also deserve a huge mention here, for as we all know, a picture book is the sum of two halves and needs to be successful on both sides. Howard brings Danny's dreams to life with fantastic characterful artwork that accompanies the simple message here perfectly. He has an awesome gift for drawing dogs (as you'll know if you've been following him on Twitter - @hwigray) capturing their energy, their expressions and all their distinctive 'dogginess' so well! When we read this through, C nodded a lot at Danny's initial plight - and it actually helped my wife and I explain why we can't really have pets either (same reasons really, we're out at work all day and you have to factor a pet into pretty much all aspects of your life like holidays etc). I'm actually looking forward to seeing where Fiona goes next on her writing journey, and I'm also very interested to see more from Howard too as his art is fantastic. We'll also be keeping an eye on Tiny Tree Publishing, who with this initial offering seem to be the sort of indie publisher who take on interesting stories and subjects. Good show all round! C's best bit: Maximus 'watering the plants' and chasing rabbits with such an expression of joy splashed across his slathery chops! Daddy's favourite bit: A solid realistic message delivered with delicious alliteration and aplomb. Superb artwork also helps to bring this story to life perfectly. 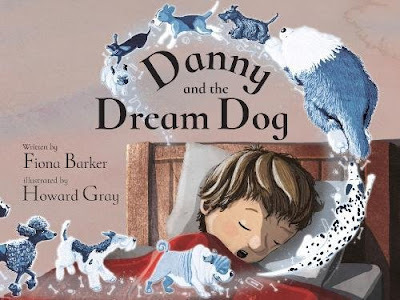 "Danny and the Dream Dog" by Fiona Barker and Howard Gray is out now, published by Tiny Tree Books (kindly supplied for review).